The right to education has been universally recognized as a human right for decades, particularly since the adoption of the Universal Declaration on Human Rights (UDHR), which lays the groundwork for the notions that education, as a human right, shall be made free, especially at the elementary level, and that higher education shall be made equally accessible on merit basis. The international legal framework on the right to education is then further elaborated in various human rights treaties adopted later after UDHR namely, the International Covenant on Economic, Social and Cultural Rights (ICESCR) Article 13 and 14; the Convention on the Rights of the Child (CRC) Article 28 and 29; and the Convention on the Rights of Persons with Disabilities (CRPD) Article 24. The Committee on Economic, Social and Cultural Rights (CESCR) elaborates some essential elements of availability, accessibility, acceptability and adaptability of education to be considered by all State Parties to the ICESCR in the implementation of the right to education in respective countries. While, Indonesia has been a State Party to the ICESCR since 2005 and, therefore, it is bound by all the obligations stipulated in the Covenant, including the obligations towards to respect, protect and fulfill the right of all Indonesians to education. Moreover, the right to education is also guaranteed in the 1945 Constitution, particularly in Article 31, which not only recognizes education as a right, but also lays the obligation of the State to allocate a minimum of 20% of the State Budget to provide education for all. See, UDHR, Article 26 paragraph (1). The global SDGs aims to achieve ten targets with regard to education. Among the ten targets, the Government of Indonesia found that seven among them are in line with the RPJMN 2015-2019. 4.2 By 2030, ensure that all girls and boys have access to quality early childhood development, care and pre-primary education so that they are ready for primary education. 1. Increased participation of children, between the age of 3-6 years, in early childhood education. a. Increased Gross Enrollment Rate (GER) of children in early childhood education to 77.2% by 2019. (2014: 66.8%). 4.3 By 2030, ensure equal access for all women and men to affordable and quality technical, vocational and tertiary education, including university. 1. The fulfillment of the right of all citizens to complete, at least, primary and secondary education. a. Increased GER in High School/Vocational School/Madrasah Aliyah/equal to 91.6% by 2019. (2014: 79.2%). b. Increased GER ratio in High School/Vocational School/Madrasah Aliyah among 20% of the poorest and 20% of the richest population to 0.6 by 2019. (2014: 0.53). b. Increased percentage of literacy among adult population between the age of 15-59 years to 97.5% by 2019. (2015: 96.6%). 4.b By 2020, substantially expand globally the number of scholarships available to developing countries, in particular least developed countries, small island developing States and African countries, for enrollment in higher education, including vocational training and information and communications technology, technical, engineering and scientific programs, in developed countries and other developing countries. 1. The availability of data and wide access to quality higher education institutions with international competitiveness. a. Increased number of foreign university students to receive Developing Countries Partnership Program Scholarship to 2500 by 2019. (2015:500). While some of the above challenges are addressed in the National Development Agenda, but there are some elements are still necessary to be considered to be included in the agenda to make sure that all essential elements of the right to education are fulfilled. 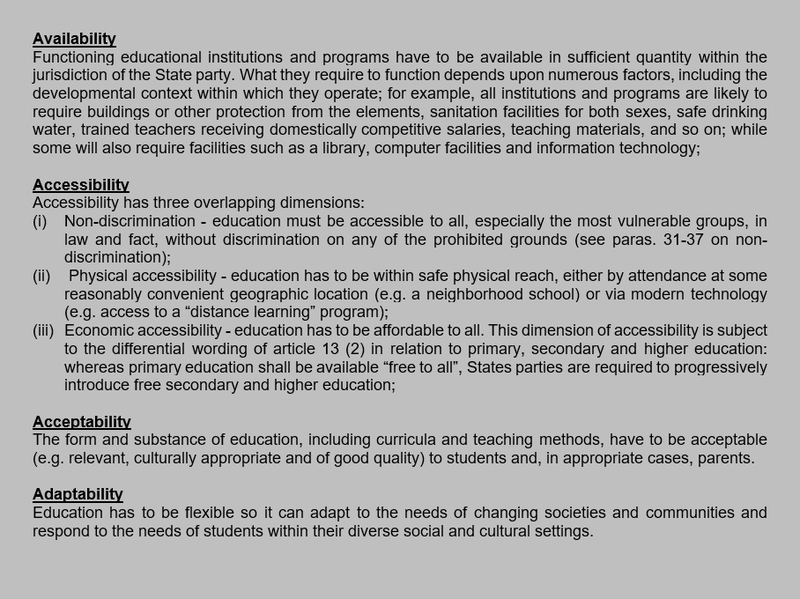 In light of the above gap analyses, we propose the following additional indicators to strengthen the national development strategy to improve the access to education for all Indonesians. – Percentage of children from poor families enrolled in early childhood education (data segregated by gender). 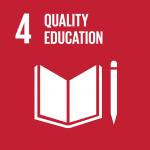 4.3 By 2030, ensure equal access for all women and men to affordable and quality technical, vocational and tertiary education, including university. 1. The fulfillment of the right of all citizens to complete, at least, primary and secondary education. a. Increased GER in High School/Vocational School/Madrasah Aliyah/equal to 91.6% by 2019. (2014: 79.2%). – Increasing financial support for vocational and tertiary education, as well as students sourced from APBN and APBD. – Disaggregation of data by gender for recipients of financial support from government for vocational and tertiary education. – Increased informal school settings adaptable for indigenous children. – Percentage of 15-year old students enrolled in secondary school demonstrating at least a fixed level of knowledge in human rights. and Hygiene for All (WASH) indicator definitions). Integrated Database (BDT) from the National Team for the Acceleration of Poverty Alleviation (TNP2K). With regard to the access to education, UNESCO would provide significant assistances for the GoI, particularly in the areas of the promotion of quality education for all, improvement of the quality of primary education and quality literacy for all. Additionally, UNICEF also has the Basic Education for All, which will provide useful contributions for the GoI, especially with regard to improving the skills of school principals, supervisors, and education officials to manage and deliver quality primary education that reaches all children; and engaging communities and local civil society to deliver better quality services for marginalized children, for example through improved school-based management.